On Christmas Eve I came out of the closet…not THAT closet. I confessed to our congregation that Susan and I have been watching the PBS hit series Downton Abbey. 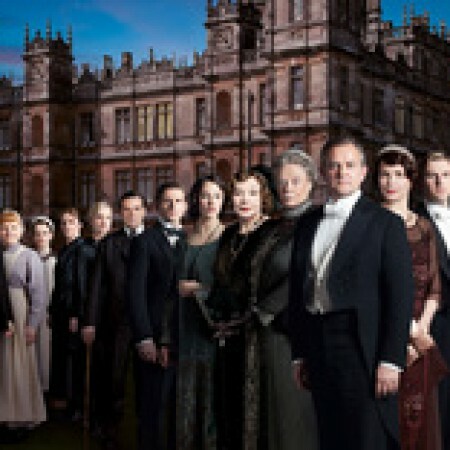 Downton Abbey is a series set in early 1900’s England. It centers around the royal Crawley family and their servants in the fictional Yorkshire country estate of Downton Abbey. The story of the family is tied to many historical events that effected the British social order. What it amounts to is a well written, well acted, interesting and entertaining Soap Opera! Now I say “came out of the closet” in a half joking way. We have only been watching it for the last month (we are watching old episodes, catching up before season four begins Sunday night) because our daughters have been telling us about it for the last three years and we finally decided to give it a try. We don’t watch very much television (with game shows and sports as the main exceptions) and allow ourselves a few “guilty pleasures” every once in awhile. But we know that no matter what you do or say, especially when you say it from the pulpit (or music stand in my case), you open yourself up for judgement, criticism and ridicule. I have already had a few people (i.e. my son) tell me they can’t believe I waste my time watching that show and I can only imagine that there are some people who, after reading this, might think the same. So before I talked about it at the Christmas Eve service (I used it to illustrate a point) I had to really think about what the potential reactions would be. How do you say something and not offend, or not cause people to think differently about you? How do you say something and stay true to who you are, being genuine and transparent even when there may be negative reactions? Watching Downton Abbey is not a sin…or at least I hope its not! And telling people that we watch it is really quite minor. It really is a “non-issue.” And that is the whole point. The reactions I think people might have may be real or imagined; they may be blown out of proportion in my own mind. But it made me think about how many people have very serious issues that are in their “closets.” Things that they struggle with. There are a myriad of things that people keep hidden away; self identity, sexual orientation, unwanted pregnancies, addictions, ungodly thoughts, immoral behavior, traumatic events of their past, etc. They are afraid to speak about them, afraid of the reactions, afraid of the ridicule and rejection they may receive. They are carrying around secrets, burdens that rule their lives because they do not feel safe to be real, they are embarrassed or ashamed of what they have done or of who they are and they live false lives, presenting false selves. How difficult it must be to live to please others, living someone else’s life. Our friend, Kelly recently said to us: “I have come to the place in my life where I would rather have people not like me for who I am than to love me for who I’m not.” After years of struggling with perfectionism, he said he feels free now to be honest in his Christian walk. As the culture changes and the lines become more blurred, as morality sinks deeper into the gray, the Church of Jesus Christ will be given the opportunity to be there when the closet doors open. Not to condone or approve…not to criticize or to judge…, but to be there…to love and to be a place of healing, of community and faith. And if we are honest, if we take a stand alongside the rest of fallen, sinful mankind, we will admit that we all have closet doors that we are afraid to open..doors that we don’t want anyone to peek into for fear of being exposed…to protect ourselves and our reputations. Or as Robert Crawley, The Earl of Grantham said in episode two of season one of Downton Abbey…”We all have chapters in our book that we don’t want published.” I think the Church can be…should be….the community that welcomes with the arms of grace and love, those who choose to open whatever closet doors they need to. It is, after all, what Jesus has done for us. Once the door is open, it will lead to somewhere. Why not to the church?